On a soggy day at the MCG, Hawthorn continued its unbeaten run against Melbourne, notching up a 13th-straight win over Paul Roos' men. It's been a decade now since the Demons last beat Hawthorn with that victory coming in round eight, 2006. 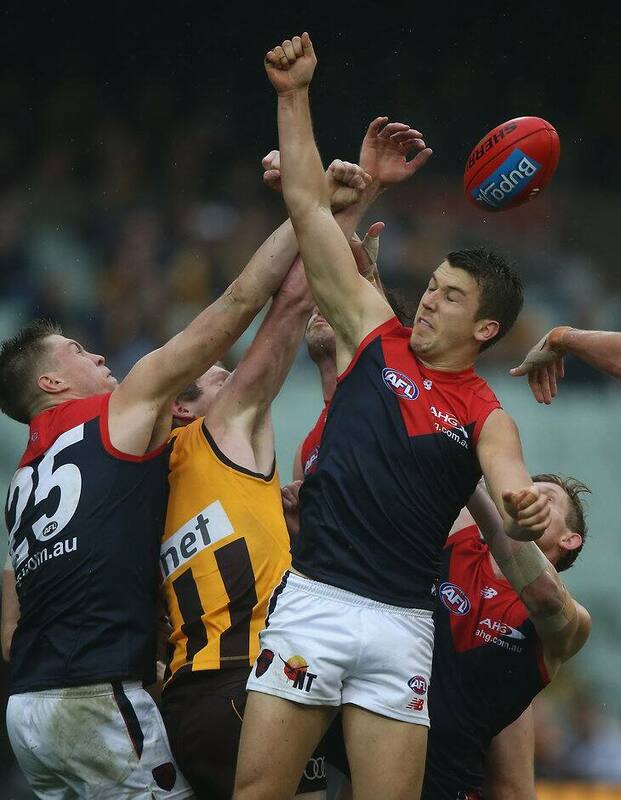 The Dees had the chance to break the drought, but came undone in a tough final quarter. The Hawks now move to 8-3 for the season, but are in no way looking like the dominant team they have been for the past three seasons. It has been nearly 800 days since Jack Trengove last played an AFL game. After two foot surgeries, and plenty of dark times in the rehab group, the Melbourne midfielder finally made his return. It was a slow start for Trengove but he slowly worked his way into the match, receiving loud applause from the Melbourne faithful when he took his first mark of the game. The 24-year-old finished with 19 touches and four clearances in a solid return. Forward Chris Dawes also made his first senior appearance for 2016 after battling calf issues. The former Pie started well, kicking the opening goal of the game but that's where it stopped. He took just the one mark for the game and had 10 disposals in what were difficult conditions for the big man. In his 200th game, Hawthorn defender Josh Gibson was superb. He had nine touches in the opening term, and 14 by half-time. His run and carry off half-back was crucial for the Hawks. It seemed that nearly every time the Demons went forward, Gibson was there, third man up, getting a fist to the contest. The veteran defender is still going strong, and doesn't appear to be showing any signs of slowing down. He finished with 18 disposals and recorded 10 one percenters in a great display in defence. For Gibson's teammate, Kade Stewart, it was a very promising debut. The tough inside midfielder had eight touches and eight tackles at half-time. The rookie worked hard all day, and was rewarded for his effort, kicking his first goal in the final term. Melbourne coach Paul Roos resisted the temptation to apply a hard tag on Hawthorn star Sam Mitchell, instead opting to pit Demon Bernie Vince against him in an intriguing head-to-head battle. At half time, it was Vince slightly ahead with 21 disposals and seven clearances, while Mitchell had 14 possessions and two clearances to his name. The battle boiled over in the second half, with both players firing up. By weight of numbers, Vince just won the battle with 36 touches, a game high 11 clearances and nine inside 50s. Mitchell was excellent for the Hawks as well with 29 disposals and six clearances. As tempers frayed in the final term, Vince was reported for an open hand hit that barely touched Hawthorn's Isaac Smith, and should get thrown out by the MRP this week. Since news broke of Jarryd Roughead's renewed battle with cancer, the entire football community has banded together to support the much-loved forward. And that continued on Saturday with a beautiful touch from the Melbourne cheersquad before the game. Their banner read "You don’t need to wear red and blue to be in our hearts. Good luck, Roughy". A lovely tribute, and one that didn't go unnoticed by the Hawthorn faithful.